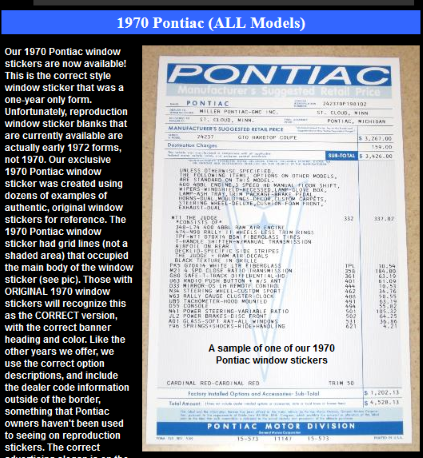 This is a site for Pontiac Trans Ams. From 1969 to 2001. On this site, I'll give a bit of history on the Trans Am, as well as some background on how I got involved in it. I'll include lots of pictures of the Trans Am. Starting a Registry for the 1980-81 Turbo TA's and Pace Cars. Hopefully, we can collect a lot of data on them. Here are a couple of New Firebird books coming out! This is an excellent site to see what your VIN decodes to. For a new service by Mike Noun, get your correct window sticker for your vehicle. Please let me know what you think of this site. Also feel free to contribute to this site with your own pics for my Reader's Rides page. A small donation would be appreciated.